Joe & Mac 2 - Lost in the Tropics is a sequel to Joe & Mac. It is follow-up to Congo's Caper, the second game of the Joe & Mac series. Joe and Mac should go in search of the seven rainbow stones in order to reach Gork's Lair, where the crown was kept in the hands of Gork. At the Frame 18 when you start this game, if you press Soft Reset, it's possible to skip the Data East and the Licensed by Nintendo Logos. It saves a lot of time! Discovered by Me. When Joe reaches the left edge of the screen, normally he will be pushed off the rope; when he is about to fall off, swing your club and he will remain airborne hanging on thin air. You can keep him airborne indefinitely by doing frame perfect club swings successively. It's only possible during the first autoscroller of the Snow Stage. Discovered by Orange Claw Hammer. 3. Hold < or >. After 8 frames, press and hold L/R again, along with < or >. Trick discovered by Orange Claw Hammer. 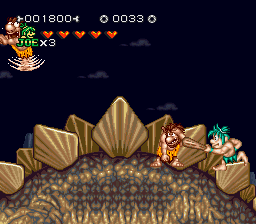 During this Boss Battles, using a pause game, it's possible to manipulate RNG Position and RNG Attacks, depending of this boss attacks or positions. Discovered by Me. Thanks a Reset Trick, I skipped the Data East and Licensed by Nintendo Logos to the Title Screen! It's not possible to reach for the other side without the help of worm. After riding the cart and break up, instead of downwards the vine, I skipped this as soon as this horizontal camera is activated, allowing Joe to move forward much earlier for some frames. Okay, this is an autoscroller part. You have no choice but to wait until night. During this time, I took advantage to make entertainment. Before the Stegosaurus to be asleep, it's possible to make the cavemen become kind of automatically slide off screen, but with a wrong air position. Instead to move forward, I avoid the freezing of character movement being at the center on the screen on the frame which this process is initiated after the stegosaurus get to sleep. Once again, you'll wait until start this Battle. It's a easy boss to defeat. So with caution for holes! After this, You'll automatically recieve the first (Red) Rainbow Stone! Your character will also automatically reach The Tiki Village. During the autoscroller, a visual glitch is used for entertainment. Before to reach the locked door, for unknown reasons, it's only possible to get the key going on closed door and then kill the enemy who has the Key. Ducking to avoid one of this enemies is 1 frame faster than clubing. Before the other autoscroller, 6 frames were improved using two clubs instead of 3 clubs: killing 3 enemies with each elub instead of 2 enemies. It's more harder than first boss, but not tougher than Gork! After this, you'll automatically recieve the fourth (Green) Rainbow Stone! forcing automatically the caveman to die. I hit Pterodactyl 4 times during this first cycle. A pause game is used to change RNG Position of this boss, because defeating in this lower position is much faster than high position. I delivered a last hit a few frames later to save more frames. After this, you'll automatically recieve the third (Yellow) Rainbow Stone! I stayed the maximum time in the water, because running on the Water is faster than no-water. Thanks for projectile of club upgrade, i hit a caveman and other cavemen earlier than club each time. I took three cycles to defeat this boss. After this, You'll automatically recieve the fifty (Light Blue) Rainbow Stone! Instead of wait to descend first and second rows of stone columns, I grab the rope to reach much faster on the stone columns. Before of start the second autoscroller of this stage, i did a Jump on the exactly moment when the screen starts autoscrolling, saving 6 frames. Once again, I did a pause game to change RNG Position of this boss. After this, you'll automatically recieve the sixth (Blue) Rainbow Stone! I go to talking with old man to recieve the second (Orange) Rainbow Stone, and I get a ride back to Kali Village. OH NO! A Village in Flames! Because of this problem, the village became an autoscroller level. Gork is TOUGH! He is much harder than other bosses of this game. During the Battle, I taked damage to manipulate the attacks of Gork (1 cycle only) to save 1 frame. After defeating Gork, You'll automatically recieve the last (Purple) Rainbow Stone! After this, go to the level entrance to the Southwest of Tiki Village. The stones will do their thing and build a bridge to the Gork's Lair! I wait for worm moves 1-2 frames to give possibility to reach the other side. This part is like a Boss Rush of Megaman games! 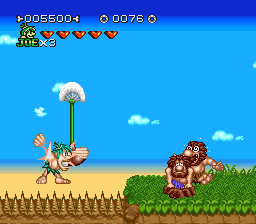 Joe will have to defeat this bosses again! In all Re-Fights, I avoid the freezing of character movement being at the center on the screen after defeating each boss. I did a pause trick once again, to manipulate RNG Position of this 2 cycles of Pterodactyl Boss Re-Fight. During the Triceratops and Water Dino Re-Fights, their invincibility times is much longer than regular fight. It can't be avoided. It is now time to move forward. You'll have to re-fight Gork now! After defeat Gork, Joe will go towards the crown to retrieve it but Gork will ask it for more power. Unbelievably the crown will help the person who stole it, leading to this second phase of this Battle. I did a pause game three times to change RNG Attack, because 1 of 3 spinning attacks of this Boss is much faster than other 2 attacks. Orange Claw Hammer, for watching my WIPs, for pointing several mistakes of my first 2 WIPs, for Hanging in the Air Glitch, Faster Turnaround Trick, and for Avoid Camera Strategy. Samsara: Excellent first run. Accepting for Moons.